2018 Jeep Compass Review | Specs & Features | Gillette WY " "
The 2018 Jeep Compass is an affordable take on the authentic Jeep® Brand. The exterior of the vehicle features a rugged yet aerodynamic design that’s sure to make you feel confident on the road. Several exterior elements elevate the car to Jeep status plus an upscale feel, such as the available black roof, chrome molding, dual-pane sunroof, and roof rack. The 2018 Compass does not lack in safety, either. Front headlamp options offer details like daytime running lamps—with an available LED lighting strip. When the sun sets, or storms hit, the projector beam headlamps illuminate which ensures increased visibility and safety. When the steering wheel is turned, the Compass has available fog lamps that will light automatically to illuminate the road and help you navigate any sharp corners. This vehicle also includes those interior features most in-demand for comfort and capability. For 2018, Jeep has ensured the Compass interior redefines a car cabin experience. The Compass interior is designed with quality materials, including available black leather-trimmed front seats complete with the detailed craftsmanship of the cattle tan accent stitching in the Compass Limited trim. The front seats of the Compass are heated and can be power adjusted eight ways for guaranteed comfort. And who can overlook the state-of-the-art, high-tech features of the 2018 Jeep Compass? They’re both sophisticated and capable, with an available 7-inch Driver Information Digital Cluster Display in full-color. What makes this display unique is that it’s fully configurable. The driver can set their settings—and graphics—to their taste. The available Navigation option integrated directly to the display for more convenient accessibility. And when you’re playing music from one of the available media options, information will appear on screen, including song title, artist, and station details (if applicable). 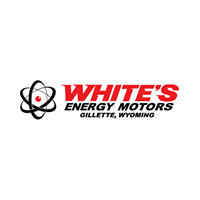 At White’s Energy Motors, your satisfaction is our sales team’s priority. Visit us to test drive the 2018 Jeep Compass today and see why it’s innovative and incomparable.